This compact shower stool is ideal for smaller bathtubs, shower stalls, RVs and boats. Also works well as a shaving stand or vanity stool. It's easy to adjust the height from 15 to 20 inch in 1 inch increments. 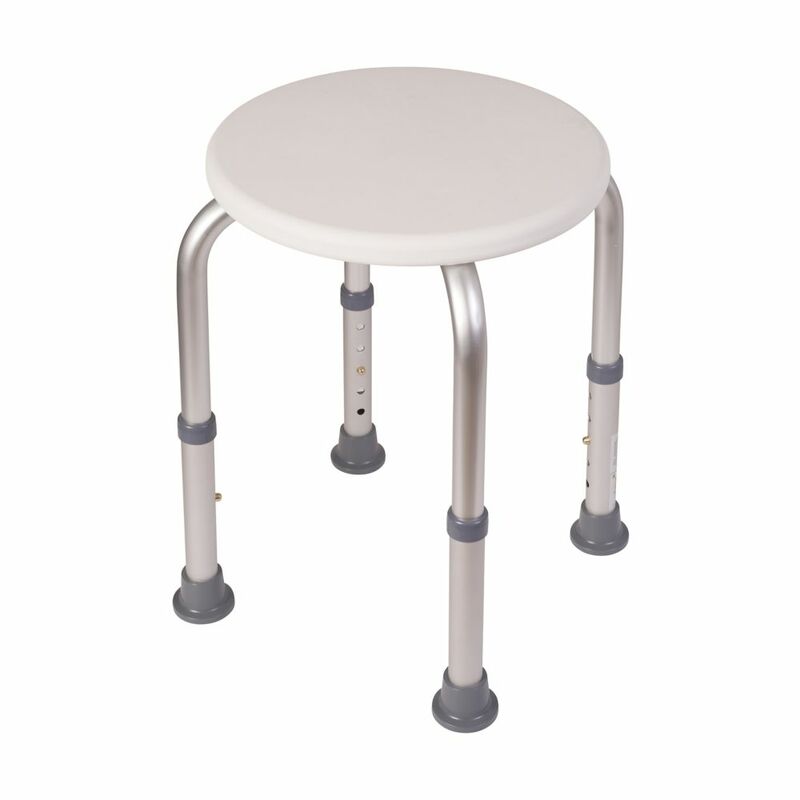 Rust-proof aluminum legs with slip-resistant rubber tips give you stability on wet surfaces. Sturdy stool supports up to 250 pounds yet weighs only 5 pounds. ARB Teak products are made from responsibly harvested grade A' teak - dried to perfection and beautifully finished. We use only the highest quality hardware made from solid brass and stainless steel, meaning no rust. Our Solid Teak Shower Bench is ideal for "wet" applications and made to withstand constant water flow. Our Teak Benches are designed to be used in showers, steam rooms or saunas. The DreamLine. Folding Teak Shower Seat is a beautiful and practical accessory that provides a convenient and safe place to sit while showering. The shower seat is made of natural teak wood in a rich colour that will add warmth to the feel of your shower space. With an innovative and compact design, you can easily fold the seat down while showering or dressing then fold it up and away for extra space when not in use. Install the shower seat at the height that works best for you. Add the perfect finishing touch to your DreamLine. shower doors or shower enclosure with an attractive folding teak shower seat. Gatco teak benches represent a high point in teak furniture craftsmanship. They are built to withstand constant water exposure while maintaining a deep, vibrant teak finish. Bring the day spa element to your home, and achieve the calming effect you seek from your bathroom of true luxury. Lightweight Shower Stool is rated 5.0 out of 5 by 2. Rated 5 out of 5 by Patricia from It was a birthday gift for someone and they were... It was a birthday gift for someone and they were thrilled.